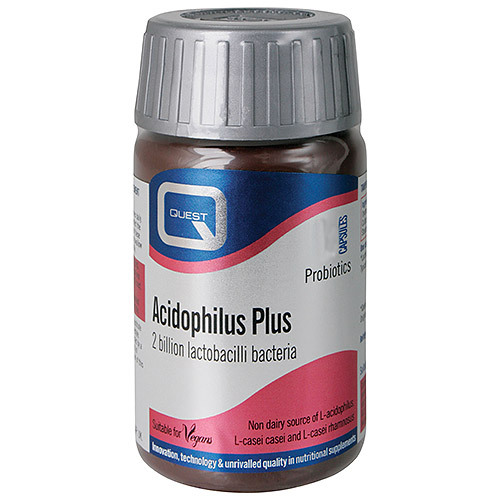 Quest Acidophilus Plus contains three strains of lactobacilli bacteria plus maltodextrin to support digestive health. Suitable following a course of antibiotics and during pregnancy. Can help promote bowel regularity. Why use Quest Acidophilus Plus? Take a look at our Quest Kyolic Garlic and Quest Super Omega 3-6-9 to find out more about the benefits Quest Excellence products have to offer. Non-GM Maltodextrin, Capsule Shell (hydroxypropylmethylcellulose, gelling agent: gellan gum), Human-Strain Lactobacilli Culture (Providing 2,000,000,000 viable Lactobacilli), Magnesium Stearate, Antioxidant: Ascorbic Acid. Take one capsule two to four times daily. To best protect the activity and control the effect of gut acid on these "Friendly" bacteria, take with or after food and swallow with water, or with dairy, soy, goat`s or rice milk. Lactobacilli grown using a soy culture medium. Below are reviews of Acidophilus Plus - Probiotic Supplement - 60 Capsules by bodykind customers. If you have tried this product we'd love to hear what you think so please leave a review. A great product to keep in the fridge. Good for upset tums, after/during a course of antibiotics or suffering from excess/over indulgence. A good supplement to boost your good flora.